Seventy-five-year-old Penelope Adams (Penny to her friends) still gets a warm holiday feeling when she walks into her Nourish food bank. 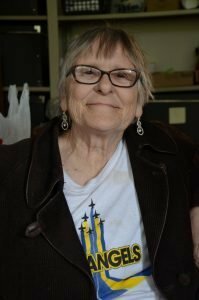 Penny has been a regular visitor at the food bank since her husband died several years ago, leaving her with limited income. Her fellow food bank clients recognize her by her brightly decorated shopping cart. Penny says without the help from food bank her cupboards would likely be bare in short order. “This really helps with the groceries,” she says. Then, in a matter-of-fact tone, Penny said that the food bank contributions she takes home do not just benefit her.